Further to the 2018 Calendar for Open Water Swimming races globally, we wanted to reflect the most commonly pursued challenges in oceans, rivers and lakes around the world. This, at the end of the day, is a sport much less regulated than traditional pool swimming, and one that encompasses from short swims below 1K to the 88K of Hernandarias Marathon and the 193K of the 7-stage 8 Bridges. 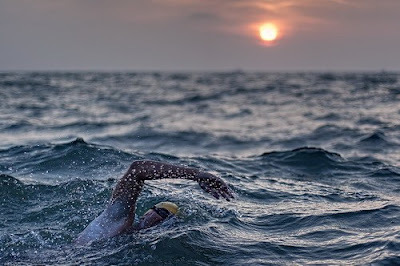 Experts agree that the pinnacle of OWS is to swim the 34K English Channel from Dover to Calais, which was first crossed in 1875 and has now been accomplished by 1,831 swimmers in history. This is less than half than the 4,000 climbers that have reached Mount Everest’s summit to date. Of course there had to be something else, so the English Channel was in 1987 grouped with the Manhattan Island Circumnavigation (46K, 970 swims to date) and with the Catalina Channel (33K, 450 swimmers to date) to create the Triple Crown of Open Water Swimming, probably the most sought-after goal today. A record of the 165 Triple Crowners so far is well documented in the MSF database. Drop Manhattan – which is not a Channel – and add the Strait of Gibraltar (14K), Cook Strait (26K), Molokai Channel (42K), North Channel (35K) and Tsugaru Channel (20K) and you have the Oceans’ Seven, a challenge reserved to the bravest, only achieved by 7 swimmers as of 2017. Other swimmers prefer to focus on unprecedented challenges. The most famous of this kind is probably the 145K Florida Strait from Cuba to Key West, which has allegedly been only accomplished by New Yorker Diana Nyad. Her 53 hour swim in 2013 has been subject of a heated scrutiny and debate, but more on that later. In fact, a common feature of all these swims is the lack of wetsuit, cage or any sort of external help, even in freezing or shark-infested waters, under the “English Channel rules”. The purist OWSers out there will insist in this set of rules, no matter what. Check the list of the most common OWS Feats today here. In a sport of unending possibilities, everything goes. Stay tuned.